Possibly Gattamelata chapel, Basilica del Santo, Padua. private collection, The Netherlands; (sale, Sotheby's, London, 8 April 1981, no. 124, as by C. Crivelli). (Piero Corsini, New York); private collection, New York, by 1984; (P. & D. Colnaghi & Co., London and New York); sold 1989 to private collection; gift (partial and promised) 1990 to NGA. This was the first chapel to the right entering the church, dismantled in 1651 when it was transformed into the chapel of the Sacrament (see Marcantonio Michiel, Notizia d'opere di disegno, 2nd rev. ed., ed. Gustavo Frizzoni, Bologna, 1884: 7-8). This earlier provenance is hypothetical; for a complete discussion see the NGA systematic catalogue entry by Miklòs Boskovits in Boskovits, Miklós, and David Alan Brown, et al., Italian Paintings of the Fifteenth Century. The Systematic Catalogue of the National Gallery of Art, Washington, D.C., 2003: 89-94. See Peter Humfrey, Gothic to Renaissance. European Painting 1300-1600, exh. cat., Colnaghi, London and New York, 1988: 26. 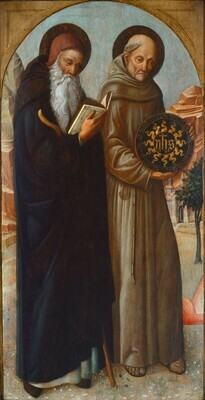 See Colin Eisler, "'Saints Anthony Abbot and Bernardino of Siena' Designed by Jacopo and Painted by Gentile Bellini," Arte Veneta XXXIX (1985): 40, n. 6. According to a letter of 22 June 1984 from the collector to Miklòs Boskovits (copy in NGA curatorial files). Nicholas H.J. Hall, ed., Colnaghi in America: A Survey to Commemorate the First Decade of Colnaghi in New York, New York, 1992: 37. Gothic to Renaissance: European Painting 1300-1600, P. & D. Colnaghi & Co. Ltd., London, 1988, unnumbered catalogue. Art for the Nation: Gifts in Honor of the 50th Anniversary of the National Gallery of Art, National Gallery of Art, Washington, D.C., 1991, 2-3, color repro. Boskovits, Miklós. "Per Jacopo Bellini pittore (Postilla ad un Colloquio)." Paragone 36, nos. 419-421-423 (January - May 1985):113-123, repro. Boskovits, Miklós. "Giovanni Bellini. Quelques suggestions sur ses débuts." La revue du Louvre 36, no. 6 (1986):386-393, repro. Christiansen, Keith. "Venetian Painting of the Early Quattrocento." Apollo (March 1987):166-177, fig. 8. Pelikan, Jaroslav. The Illustrated Jesus through the Centuries, New Haven & London, 1997, p. 117, repro. Boskovits, Miklós, David Alan Brown, et al. Italian Paintings of the Fifteenth Century. The Systematic Catalogue of the National Gallery of Art. Washington, 2003: 89-94, color repro. Banzato, Davide, Alberta De Nicolò Salmazo, and Anna Maria Spiazzi, eds. Mantegna e Padova,1445-1460. Exh. cat. Musei civici agli Eremitani, Padua. Milan, 2006: 104 fig. 18 (as part of the hypothetical reconstruction), 105.